I have heard from many of our customers that they prefer to ‘eat-in’ since they found us! They have often said they find our beef to be so superior to the restaurant experience, that they are willing to cook at home. 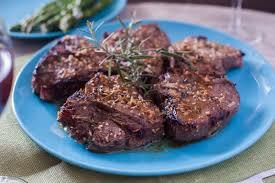 The day before, take the steak out of the frig and package, place it in a glass pan, and douse it with seasonings. I use Garlic, salt, and pepper. Feel free to add worcestershire sauce or other flavors you like. Teriyaki is easy to make from scratch. Some people will add a tenderizer, but it’s not required. While a fry pan can work, I prefer the broil setting on my oven. I will usually make the steak last, allowing it to warm up to room temp while I prepare all of my side dishes. Maybe using the oven to cook other things first. I place the steak on the peppers, onions, garlic, and mushrooms, etc on an oven safe pan. then on the 2nd or 3rd shelf in the oven, get the steak going. For rare, use the top shelf, and watch it closely. When it’s half done, push the goodies from under the steak to the edges, and flip the steak. it should be done about the same time. If you do use a fry pan, turn the heat down to medium- medium low, That bone needs time to warm up! The meat is always done last near the bone. Our favorite is sweet potatoes, or seasoned potato wedges. I will cut the sweet potato into 4 quarters the long way to speed cooking time. either in a glass pan, or wrapped in foil. take them out when they are easy to stick with a fork. The herbs seasoning we use is a dump mix of what I have in the cupboard. I let me taste buds guide me. I apologize, I’m not into wine, but I bet the folks at the liquor store can tell you what goes great with the meal you have planned. You can cook your asparagus, and other veggies stir fry style in the juice left when the steak is done, while it rests before serving. Turn the oven off, and let the steak just sit for 10 minutes.